Happy August! I'm on a quilting vacay in my home state of Idaho. The number for August's UFO is the color of the sky in central Idaho. I actually (!) have a finish of my own to share, but it will have to wait until I get back to Colorado -- I can't figure out how to upload the photo from my new iphone. Doncha just love technology? In the meanwhile, here are the July finishes by 52 Quilts followers. 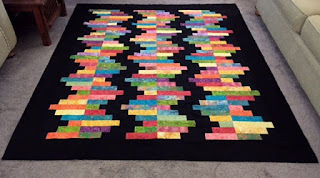 Becky finished not one, but two quilts using the Tonga Treats strip pack she won in the 52 Quilts 600 followers giveaway. There are more than 1000 followers now! You will be so happy about my July finish for the August UFO Parade! Not only is it already done and it's only the first week of July, but do remember that Tonga Treats pack that I won waaay back in March 2015 in your 600 posts give away? 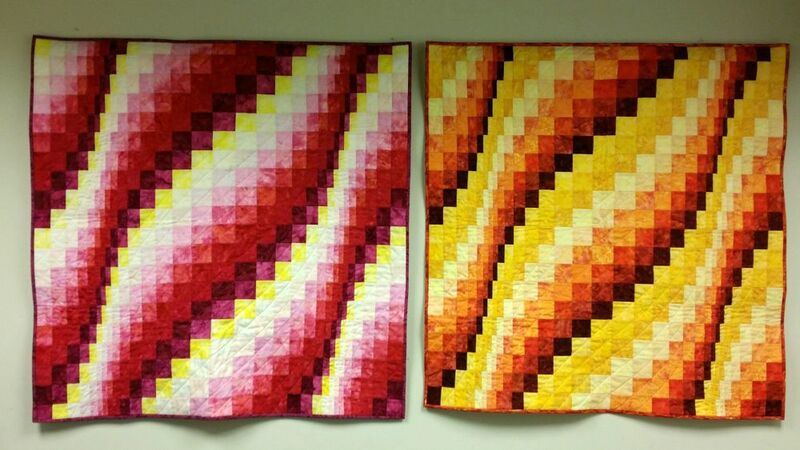 It finally is two completed bargello wall hangings! Here they are hanging in my office at work. I love how even though they are the exact same pattern the color placement makes them look so different. The motion is mesmerizing! So now when you're gazing off in the distance, Becky, you can actually be thinking about quilts! Ethel had a busy July, not just quilt-wise, but work-wise. Congrats on the promotion, Ethel! (This) quilt was inspired by a pattern I found on "Quiltville" called "Scrappy Mountains Majesties." I tweaked it to look like sawtooth blocks. 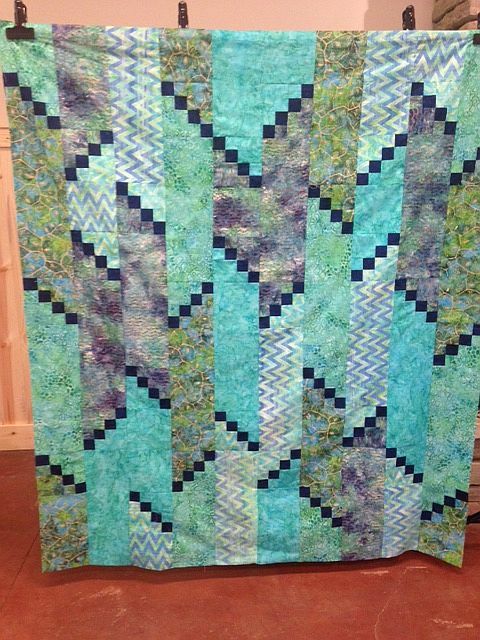 I used less than one layer cake and some yardage (background) for this quilt. It ends up measuring 62" x 70". 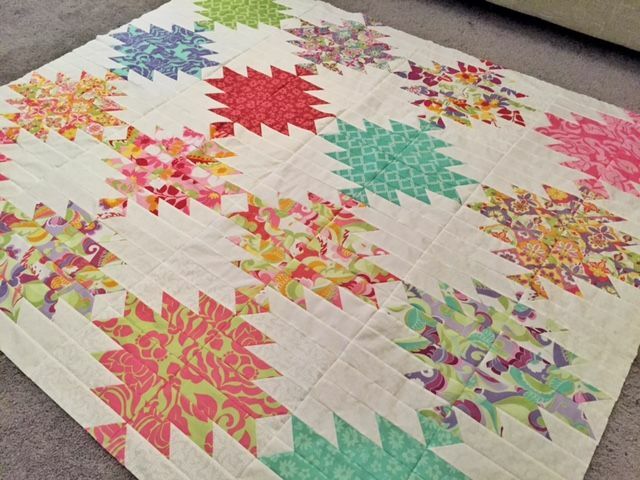 This batik beauty is a Villa rosa design, "Wistful." "I have two more UFOs to finish and I think I'll be done for the year. I'm also trying to bust my stash (especially my 30s and my Kaffe stash). 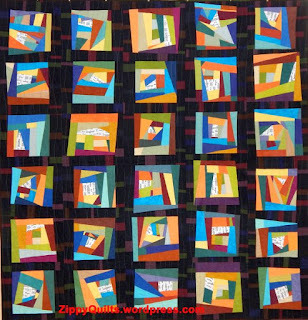 I'm also leaning more towards modern quilt patterns." Only two more UFOs, Ethel? Incredible! Sandi, I hope the August UFO #6 is a simple one, so you can stay on track! 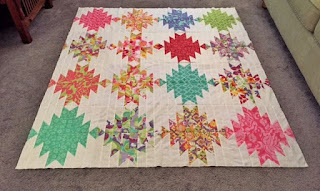 All there is to say about Sue's July finish is: WOW! 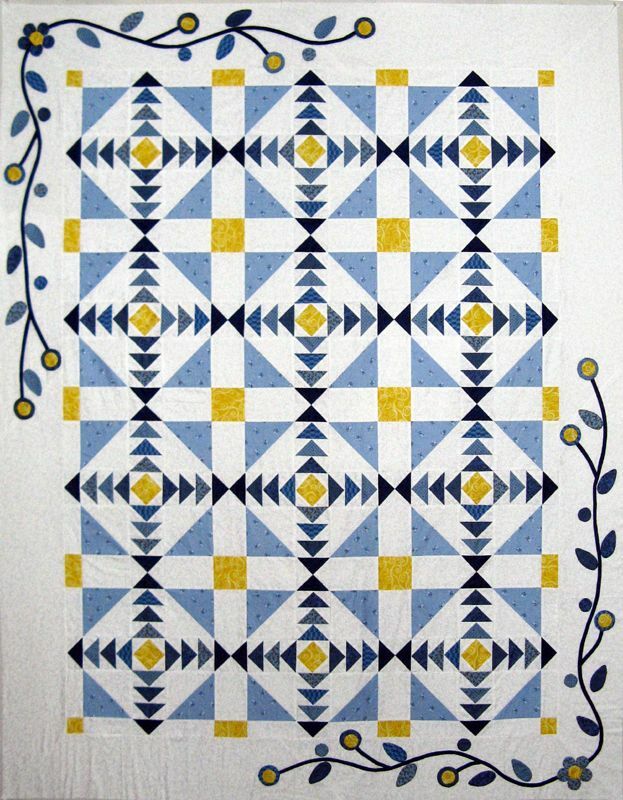 She writes this is a quilt made from block received in a block swap. 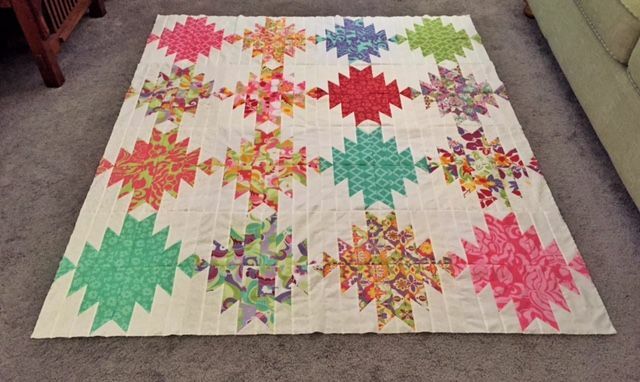 She wanted it to be really colorful, so added the bright sashing. 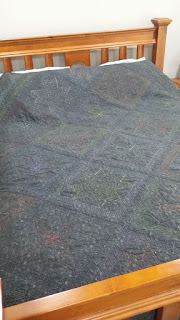 The quilt was supposed to finish as a single-bed size, but it turned out to be queen-sized! 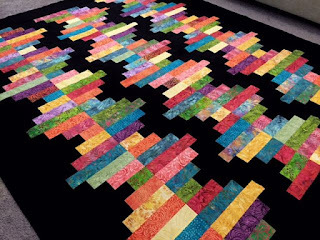 Be sure to click on the second photo to see detail of the gorgeous quilting. 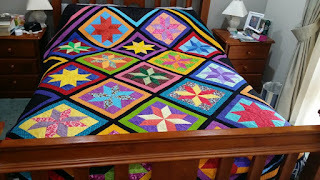 And here is a link to Sue's Quilty Bits and Bobs, so you can read all about it. 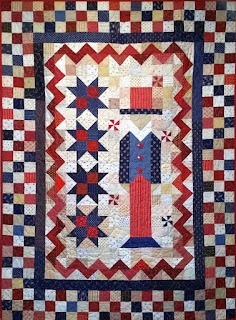 Kerry is right on the seasonal target with her July finish, "Uncle Sam." 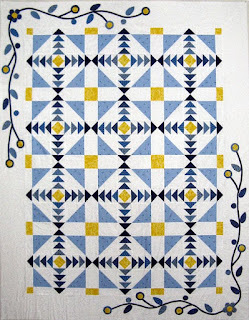 It's an oldie-but-goodie from Quiltmaker magazine July/August 2000! Kerry tells the whole story here at Kerry's Quilting. I love it Kerry -- I'll have to ask my contacts at Quiltmaker if that pattern is still available! 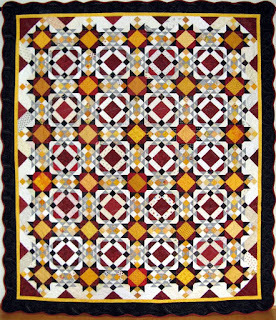 Mary J's finish is one she has been working on for more than a year. 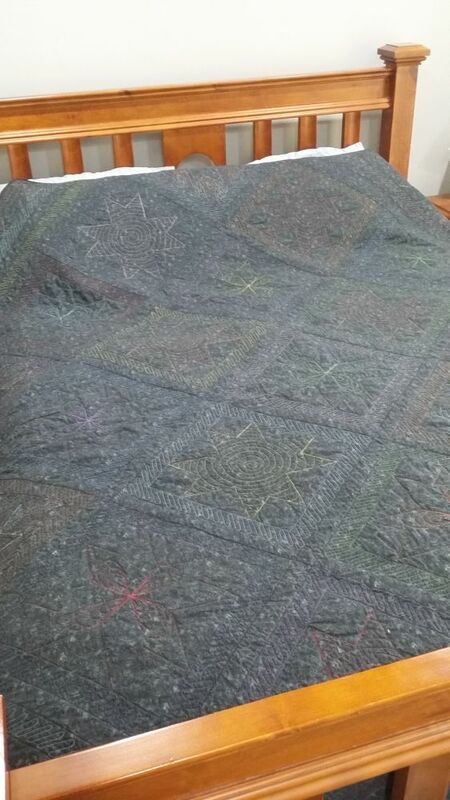 It's "finally finished," all the way through the binding! 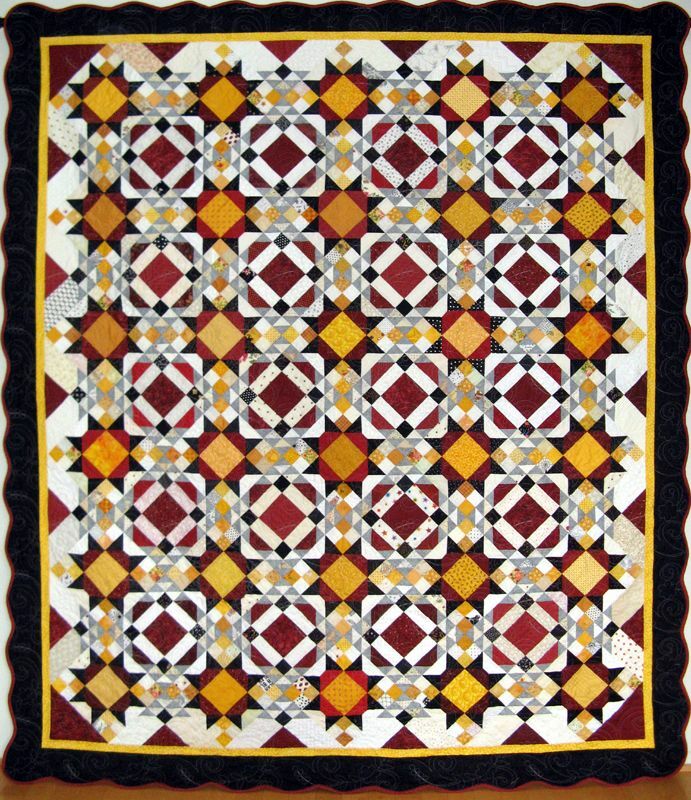 "Cherrywood Toss" was made using a scrap pack of Cherrywood hand-dyes. Yummy! 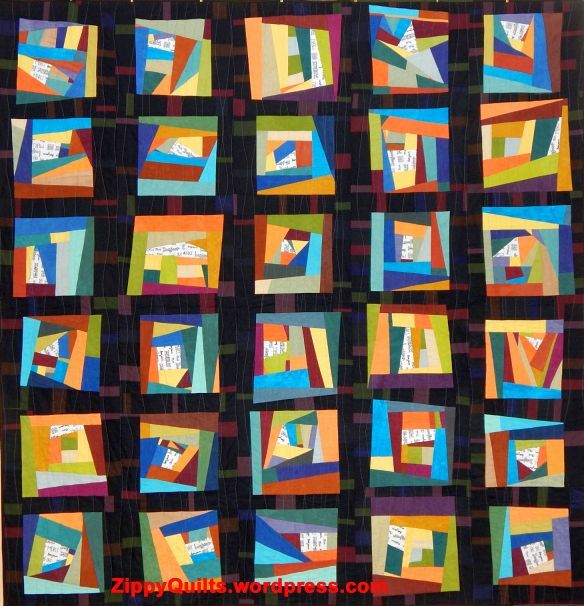 Get the rest of the story at Zippy Quilts, here. My Idaho quilter buddy, Martha, got a good start on this quilt while we stitched together in Stanley. 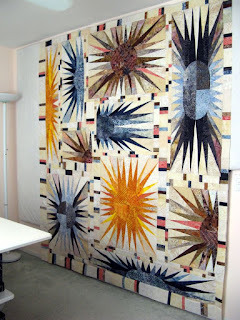 She finished it at the Boise Modern Quilt Guild's first retreat. 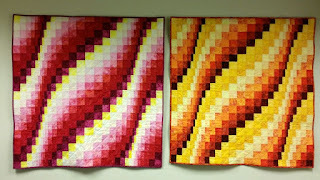 You can go to Atkinson Design's page, here, to see many other color choices for Martha's quilt. But I think I like your's best, Martha! Happy August finishing to you all, and keep those cards (photos) and letters (emails) coming! Wow! 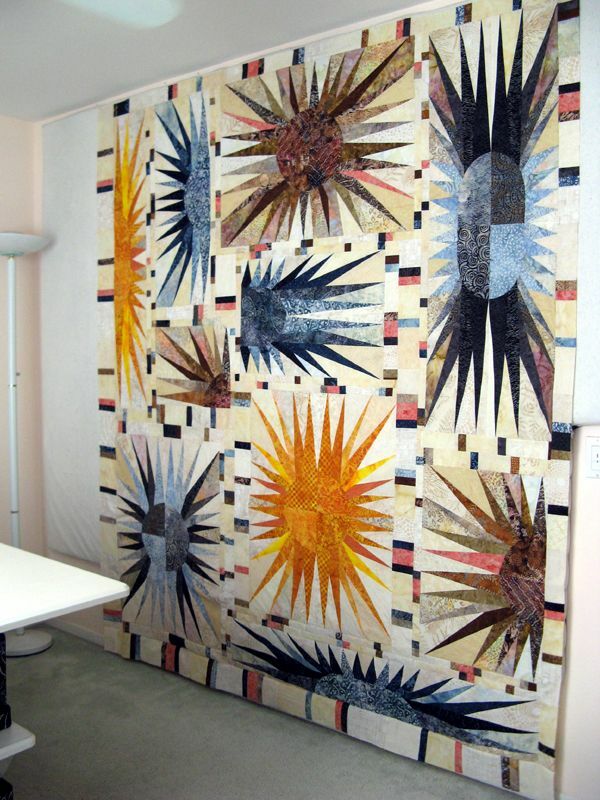 So many beautiful quilts!!! Great quilts this month. 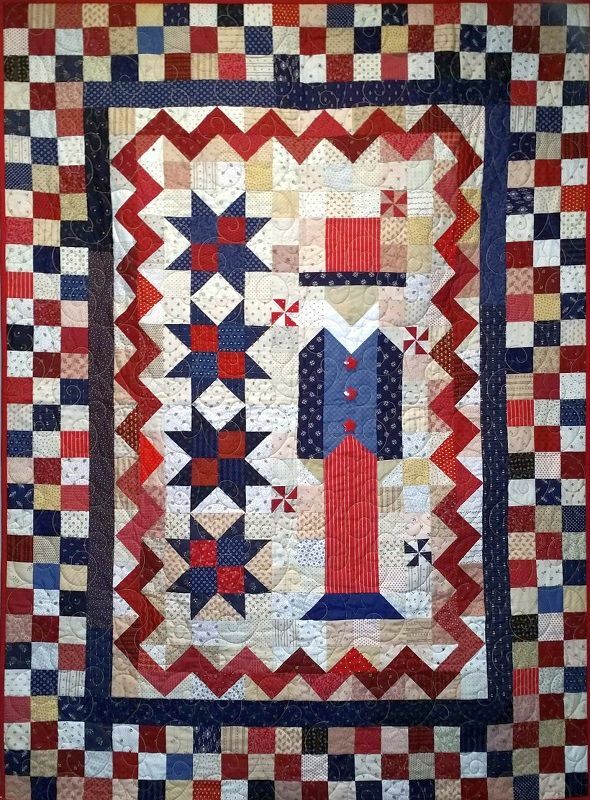 I don't know how Sandi comes up with such intricate quilts month after month! I just love Kayenne. So different! Love Ethel's Batik Beauty too. Simple but gorgeous! Well done everyone!